Istanbul, Turkey. Tuesday, October 2, 2018. 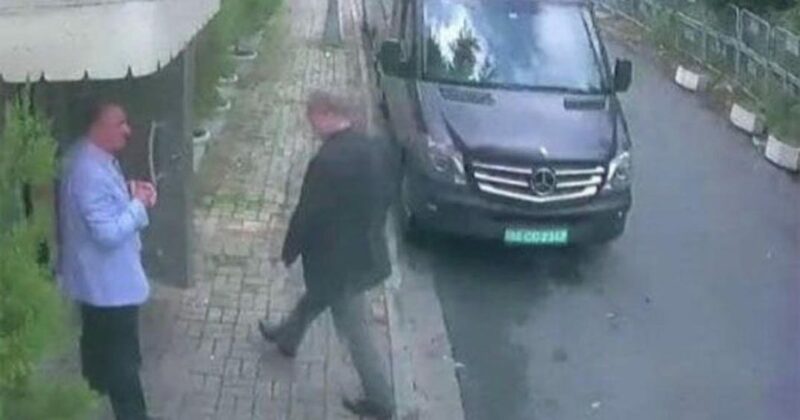 At exactly 1:14 p.m., exiled Saudi citizen Jamal Khashoggi enters the consulate of Saudi Arabia in the heart of the Turkish metropolis. He wears gray pants and a beige shirt with a black sports jacket. With his round, bespectacled face, receding hairline, and incipient white beard, he could pass for a university professor. In fact, he is a staunch critic of the Saudi regime and a columnist for The Washington Post. Khashoggi is tending to a personal matter: he requires consular documentation to get married—the second time for the 59-year-old journalist—to Hatice Cengiz, his Turkish fiancée, 22 years his junior. He knows that he is on the blacklist of the Saudi government and, in particular, in the crosshairs of the powerful Crown Prince Mohammed bin Salman, who has been a frequent target of Khashoggi’s diatribes in The Post. In the apparent safety of a foreign country, however, Khashoggi lowers his guard. Cengiz waits outside the consulate, with clear instructions to alert the media and authorities if anything delays his departure. They fear he might be interrogated or, worse, forcibly returned to Saudi Arabia. What neither of them envisions is that Jamal Khashoggi will not leave the consulate alive. Or that his death will unleash an international diplomatic storm that will test the true commitment of Western liberal democracies to the protection of human rights. The multiple, changing versions of events released by the Saudi government singly and collectively defy credibility. But, individually and together they seek to exculpate Prince Mohammed bin Salman of any responsibility in the murder of Jamal Khashoggi. More broadly, they serve to deny any direct link between the incident and the government of Saudi Arabia. The truth, however, has gradually surfaced—largely thanks to an audio recording of the events inside the consulate that the Turkish government was somehow able to produce, and which it sent to the intelligence agencies of the United States and several European governments. Khashoggi’s struggle, his futile pleas for his life, and the moment of his last breath were apparently all captured in that recording. It is now clear that Jamal Khashoggi was the victim of premeditated murder. Video footage from the Istanbul airport and security cameras throughout the city indicate that at least a dozen operatives from the Saudi intelligence services arrived in Istanbul a few hours before Khashoggi was scheduled to visit the consulate. The commandos, led by General Ahmad Asiri—a known confidant of Mohammed bin Salman—headed back to the airport, then to Riyadh, immediately after Khashoggi was killed and his body methodically dismembered for discreet disposal outside the consulate. Agnes Callamard, the United Nations special rapporteur leading an inquiry into the death, has called the incident “a brutal and premeditated killing, planned and perpetrated by officials of the state of Saudi Arabia.” Western intelligence agencies concur: an operation of such magnitude required prior authorization. According to the U.S. Central Intelligence Agency, the murder could only have been carried out with the approval of the highest levels of the Saudi government and, in particular, of Crown Prince Mohammed bin Salman. In an intercepted conversation from a year before the killing that surfaced in early 2019, he tells an aide that he will “use a bullet” on Khashoggi should the journalist’s criticism of the Kingdom persist. While the Khashoggi murder illustrated the Saudi regime’s contempt for human rights and warranted intense media attention, it was only the latest incident in a consistent pattern of repression and human-rights violations at home and abroad. By any modern standard, Saudi Arabia is a human-rights pariah. Saudi violations of human rights and international humanitarian law are not confined to home territory. The catastrophic humanitarian crisis currently facing neighbouring Yemen is the direct result of a military intervention led by Saudi Arabia. A UN panel has denounced the “widespread and systematic attacks on civilian targets” by the Saudi coalition in Yemen, and organizations such as the International Committee of the Red Cross have indicated that the bombing campaign, operated by Saudi Arabia, indiscriminately targets combatants and civilians alike. Yet leaders the world over refuse to sanction the reprehensible behaviour of Saudi Arabia. Weeks after the killing, Canadian Prime Minister Justin Trudeau pledged, with apparent resolve, that Canada would “not hesitate” to freeze arms exports to Saudi Arabia after the horrific assassination, emphasizing that Canada will be “firm” in promoting and protecting human rights. However, as the media storm has subsided, it has become clear that the deed will mostly go unpunished. Germany took the bold measure of halting all arms shipments to Saudi Arabia. But, with the United States, the United Kingdom, France, and Canada continuing to export arms to the Kingdom, it seems unlikely that the German example will be replicated. Why so little negative response to such egregious behaviour? The answer, to a significant extent, has to do with the lucrative contracts that some arms-exporting countries have to sell weapons to the Saudis. Strategic considerations related to Saudi Arabia’s regional influence, including its stand against the Iranian government, as well as the power it wields in the global oil market, also constitute key factors. The Canadian government claims that it would likely face financial penalties if it were to cancel the 2014 multi-billion-dollar deal to sell light armoured vehicles to Saudi Arabia. By this logic, it seems that the Government of Canada’s sovereign mandate, prerogative, and obligation to faithfully implement the law—including cancellations of arms export permits—are somehow subordinate to the language of a commercial contract. And this raises some troubling questions. How can the duty to implement the law be trumped by financial expediency? Is the government attempting to deflect the focus from international human-rights obligations to the size of the financial penalty Canada would pay? How much would Canada be willing to pay to support human rights abroad? Why is Canada seen to be breaking the contract if it suspends shipments, but Saudi Arabia isn’t when it commits gross violations of human rights, in defiance of domestic and international export regulations? The unrelenting pattern of human-rights violations in Saudi Arabia, the deterioration of the humanitarian situation in Yemen, and the assassination of Jamal Khashoggi have served to mobilize public opinion in Canada and other arms-exporting countries against the Saudis. But, thus far, most countries have opted to keep the juicy contracts.